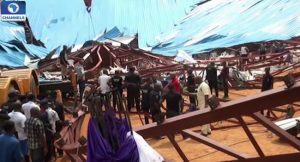 It was a black Saturday in Uyo, the capital of Akwa Ibom State, as the roof of Reigners Bible Church, a popular church in the city, collapsed during a church service, leaving many dead and several others injured.Church faithful and guests including the Akwa Ibom State Governor, Udom Emmanuel and members of the State Executive Council had gathered at Reigners Bible Church, along Uyo Village Road, Uyo, for the Bishopric Ordination of the General Overseer of the Church, Apostle Akan Weeks, when the roof of the church collapsed. Governor Udom Emmanuel escaped unhurt but many people lost their lives while several others sustained various degrees of injuries. Giving an account of what happened, one of the survivors said: “Normal church service was going on. Everything was normal. It was about 20 minutes after the governor arrived. Suddenly, the roof fell on worshippers. The governor was quickly rescued. But others were not that lucky. It is very unfortunate”. Another eyewitness told Channels Television that a driver of a vehicle was one of the dead. “Right now, we really can’t say how many people are dead in there. I cannot believe it,” he said. A man who was inside the church when the roof caved in said he was running out of the building when he saw a steel rod fall on a well-dressed man, breaking his head open. “I am sad that I saw it but I thank God I escaped,” he said. Sources close to the church said that the church was being renovated and upgraded ahead of the event. 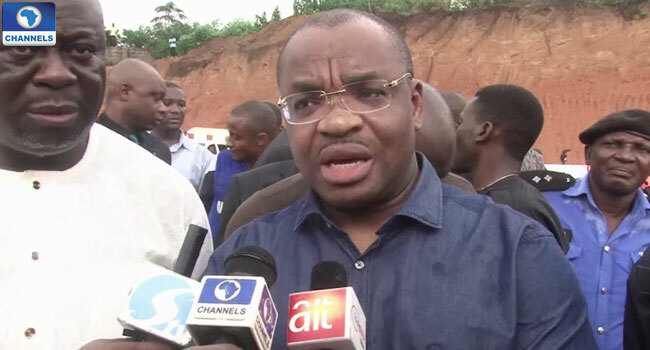 Governor Emmanuel expressed the government’s condolences to families of the victims. “It is a sad day for me. My condolences to families of the victims. I advise everyone to be calm,” he said. The Governor, who escaped death, hinted reporters that a panel would be setup to investigate the incident. “Accessing this in the face of somebody who is not an engineer, we see a lot of defects in the construction. We will try as much as possible to bring those who were careless about this to book. 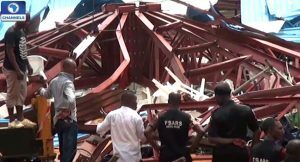 “I will make contact immediately both the Nigerian Society of Engineers and a team of engineers here in Akwa Ibom to assess whether there were pure negligence on the part of those that did this,” Governor Emmanuel told reporters. He said it was a devastating incident, wondering why it should happen at this time. “Actually, it is not a good thing and we are really devastated that this could happen. “Be rest assured on the part of government, we will do everything possible to make sure that this will never happen again in this state,” he added. The governor also visited the victims at the Ibom Specialist Hospital where they were receiving treatment. The number of persons killed in the incident have not been confirmed by any agency. After the building came down, rescue operations were launched to remove the debris.